Almond butter brown rice crispy treats! My sister and I used to love rice crispy treats as kids. Since I rarely eat marshmallows these days, I’ve been loving this slightly healthier alternative that uses almond butter and brown rice syrup as a binder instead. 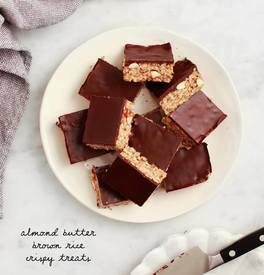 I also packed in omega-rich hemp seeds, almonds and shredded coconut – making these a filling treat to get you over that 3 o’clock slump.